My own father used that first one on me, not referring to his relationship with my mother, I never remember him telling me he loved her, but of one of his subsequent marriages. The second quote is one I have heard often and that has ended up in the CN email inbox numerous times. What do those comments reveal about us? To me they show that as a society we have come to believe and accept that love should always make us feel good. That love is a temporary emotion which lacks any significant strength in our relationships. That love is determined not by an internal commitment, but by our external circumstances. What do you think the difference is that people are trying to convey when they make statements about loving their spouse vs. being “in love” with their spouse. To me they are two sides of the same coin and it is important to be intentional about pursuing both in marriage. Even the Bible speaks of people being in love. In every case the use of the phrase “in love” is use when speaking of romantic love. So then, is being in love about emotions and passion? Perhaps so. That passion is important and if we get apathetic about romancing our spouse it is very easy for that passion to get extinguished. It’s at this point that people use the above phrase, “I love him, but I’m not IN love with him.” The passionate feelings are gone. The desire as been diminished. All because both the husband and the wife pulled back and became inattentive and indifferent, and it was probably not intentional. So once people have fallen out of love, what is the solution. First of all, turn to the Author and Perfecter of Love, the Source of Love, the One who established marriage and wants the BEST for us in our covenant with our spouse. Prayerfully invite Him to teach the two of you how to romance each other again, to stir your hearts for one another again, to take the two of you into a depth of intimacy and passion that you can not get to on your own. Seek out his Word both in the Bible and that has repeatedly been spoken over you by the Body of Christ. My husband and I have had so many people speak the same blessing over us that we began to think that everyone heard that blessing, but that is not the case. That is a promise for us. And look at Scripture! What amazing encouragement and what a practical guide for how to love well. I get excited reading all those promises and that is just the tip of the ice burg. Scripture is FILLED with promises like that. So if you have fallen out of love, start speaking those things over your marriage and start acting them out by the power of the Spirit of God within you. I mean, my goodness, let’s speak those fantastic things out even if we are enjoying great joy in our marriage relationship. Once you have called out to God to restore your love, start seeking out godly mentors who can model and teach you authentic love in marriage. 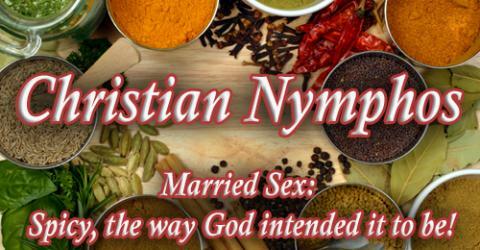 You’ll find a lot of women who read and comment here at Christian Nymphos to be a great resource and, of course, we who operate this site want to give you as many tools, ideas and support as we can in your journey with your husband. Be careful about disparaging remarks that your friends make about their husbands or men in general. This will not be helpful to you if you are already feeling a negativity about your marriage. I’d really encourage a couple who has fallen out of love to begin studying their spouse. Go on dates. Think about The Five Love Languages. Spend a lot of time looking for the treasure in them. Be quick to listen, slow to speak and slow to become angry. Find out what their dreams are or, if their dreams have dimmed, stir up those things again in them. Make yourself the safest place for your spouse to rest, trusting fully in your faithfulness no matter what your circumstances are. Don’t settle for less than what God has said about love. Are we always going to live in the perfect love of God? One day, but as it stands now, sometimes we cease to live in the power of the Spirit that is in us. Sometimes we fail at living out perfect love. But I am not going to let that stop me from trying. I am going to go after perfect love if it kills me, and it probably will. I need my selfishness to die. The pride of needing to have my voice heard in situations where God has asked me to be silent. The unrighteous anger that sometimes rears it’s ugly head and demands my own way. When it dies, my Lord will rise higher and all that is mine in this mystery life in the Spirit (Romans 8) will be made complete. That is worth fighting for. Love is enough. True, godly love, is always enough. Sometimes it is all we have left, and it is enough. Well said, once again! 🙂 I once had a pastor who said that real Love is not an emotion, it is a devotion. It is something you actively do. Yes, romantic love exists – that chemistry or wonderful feeling – but so does real, lasting love. I believe that without this deep love – Agape – romantic love cannot survive. As you say, when couples become indifferent love diminishes. Whe you actively practice Love, practice the things said in 1 Corinthians 13, you keep romantic love alive too. WIthout this though, that romantic spark will die out sooner or later. How could the Bible say “Husbands, love your wives” if it was an involuntary emotion? It isn’t! Love takes work, it takes sacrificing your own needs, but the rewards are so amazing! I love what my photographer told me a few weeks before my wedding. She said “don’t marry him because he makes you happy. Marry him because you can make him happy”. What wonderful inspiration! One that I often think of and use to whip my thinking back when I want to tend to selfishness! How true! How much I need to let God fill my longing for intimacy first and allow Him to be the lover of my soul! Being satisfied in God’s perfect love, I can love my DH and know his love so much more fully. Your article brought a rush of thoughts and emotions. I confess to being on both the giving end and receiving end of “I love you but I’m not in love with you.” I don’t think anyone was fooled by these attempts to let the other down easy. It might have made the giver feel better but not the receiver. Worse, it confuses the innocent. One of my dearest friends was 25 years old before her father told her he loved her, and only then because of a crisis. I’m sure he did love her but a combination of New England reticence and squeamishness showing affection undoubtedly inhibited him. But love wasn’t about him, it was about his daughter, and 25 years of not knowing your father loves you made a terrible impact and made it nearly impossible for her to have a fulfilling relationship with either her father or her husband. Women, if your husband can’t show affection, work with him, insist he address the problem. It’s better late than never. Well said Cinnamon Sticks. It’s good to be remind once agian. Your words reminded me of some of Dr. Chapman’s different Sunday sermons on the topic. If we do one thing everyday to meet our DH’s love language and keep their “love tank” full it makes it so much easier to have that love for them. We can always ask our DH how full their “love tanks” are and if they are not very full we can fill them. If theirs are full they will be more willing to fill ours. Plus we as wives need to remember to respect our DHs. In his book, Love and Respect, Emerson Eggerichs talks about this cycle. If we disrespect our husbands we make it hard for them to love us and the cycle starts. But if we respect our DH and build them up we start a wonderful cycle. According to Eggerichs our respect for our DHs motivates his love for us which motivates our respect for him. It’s a wondeful cycle to be in. Both of my parents were divorced prior to marrying each other. About a year after I was born (3 years after they got married) my mom told my dad she didn’t love him anymore. He went and spent the night at his dad’s house, but came back in the morning and said, “I’ve had this happen to me once and I’m not letting it happen again. I love you and I’m not leaving.” They have now been married for over 31 years. We talked about marriage a lot in my house growing up. My parents went on marriage retreats and went to seminars and heard lots of things. The one thing that stuck out most to my dad (which he often shared with me) is this: “Love is not an emotion, it’s a choice.” Just like his decision to stay with my mom despite the fact that she said she didn’t love him. He may not have felt very loving, but he was choosing to love her nonetheless. I’m sure many of us have been through those days where we don’t “feel” like we love our spouse, but we stay and choose to love because that is what love is. It’s hard work, but it’s so well worth it. I agree wholeheartedly that, as someone said, love is not an emotion, it is a choice. Love is not always easy. Sometimes it might seem simpler to walk away. You need to WORK to stay with the person you love sometimes, but it is worth it if you’re willing. I’ve once heard a comment that suggested marriage is a 50/50 partnership where wife and husband agree to do their fair share to make the relationship work. I’ve found that in marriage there are times when either I or my husband has had to pull a little more than half the load. The reality is that there will be times when either husband or wife will fall short of the 50% mark. It is then when we need to have either a generous heart or the blessing of a loving husband that will be willing to go beyond the half way point in order to make a marriage successful. My daddy used to say relationships weren’t 50-50, but at least 100-100, if you didn’t have to sometimes give 200%.